It seems like just about every movie whose protagonist is a young woman has to have a love interest for her. In some cases (Disney, I’m looking at you), the young woman’s entire adventure revolves entirely around getting her man. Not exactly inspiring for young girls who are more interested in adventures than in boys. Thankfully, Pixar has finally produced a film whose young female protagonist sets the plot ball rolling by refusing to get married. Merida (voiced by Kelly Macdonald) is a teenaged princess, the eldest child of Lord Fergus (voiced by Billy Connoly) and Lady Elinor (Emma Thompson). She has her mother’s face and figure, and her father’s bravery, stubbornness, and taste for adventure. Against her mother’s will, he teaches her to fight and shoot, and generally encourages her to do the things she enjoys. Her mother, meanwhile, pushes her to be a proper princess. When Merida learns that a competition has been set up so that one of the sons of the neighboring clan rulers can be chosen for her hand, she’s appalled. It’s not even that she doesn’t want to marry those boys in particular — she hasn’t met them. She doesn’t want to get married, period. She is, she argues, not ready. It’s implied she might never be ready. Her desperate attempt to change her fate, to change her mother’s mind, has unintended consequences, and not just for her mother, either — her young brothers are also caught up in the curse Merida unleashes on her family. “Brave” is paced well, and although many of the characters are essentially stereotypes, they’re all affectionate ones. When Merida and her mother finally come to a meeting of the minds, it’s a truly affecting scene. Moreover, the art is stunning. It’s cartoonish enough to avoid the uncanny valley / zombie-eyed effect of some CGI films, and the characters are wonderfully presented. 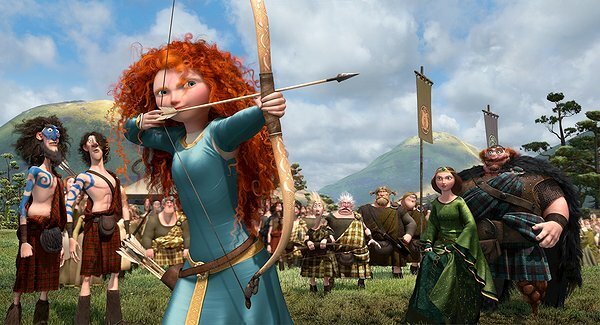 Merida’s hair is almost a character in its own right, and the various dogs, guardsmen, and wildlife that populate the gorgeously-detailed, Scottish-inspired landscape are very impressive. This isn’t to say the film doesn’t have flaws. It opens and closes with some deep-sounding but ultimately meaningless voiceover, for example, and it’s a bit frustrating that not a single male character in the film is shown to be intelligent. Fergus comes closest, but he’s still the comedic stereotype of the lovable lug of a father, brave in battle but spineless in the home. The cure for sexism in films isn’t to reverse the statistics by having the only characters in the film with any intelligence and depth be women, it’s to even the odds so that there are smart and complex characters of both sexes. That said, it’s a joy to have a heroine little kids can dress up as whose arc isn’t focused on becoming a bride. Merida is her own person, as brave as anyone else in the story, and ultimately the one who saves the day. Moreover, Merida’s great breakthrough, the climax of her story here, is about overcoming her self-centered teenaged perspective and seeing other people as they are. This is a kids’ film for tomboys and other kids tired of the same old “and then they got married and lived happily ever after” ending. Adults may find it too simplistic at times, but ultimately, we’re not the audience.